Challenge yourself on AVA’s NEWEST adventure, the Granite Via Ferrata. To start your excursion, you’ll zipline among the treetops then begin traversing along the granite cliffside above the Arkansas River Valley. Ascend crags, rappel down a rock face, jump the 65-foot free fall, and cross multiple suspended bridges on this mountaineering course. Built at the base of the 14,000+ foot remarkable Collegiate Peaks, this exhilarating venture is one for the books. Visitors Rated 5.0 / 5.0 based on 437 ratings for Via Ferrata Tour. At AVA Rafting & Zipline, we believe you should know what you’re buying and how much you’re going to spend. We believe in added value to make your experience special. We don’t want you to feel “nickel and dimed” when you show up for your trip with us. Your Via Ferrata tour includes everything you need. We try our best to prepare you with gear lists and suggested things to bring so that you don’t end up paying for unneeded add-ons. 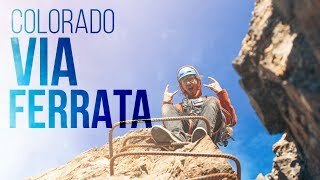 Head out for your Via Ferrata Adventure!